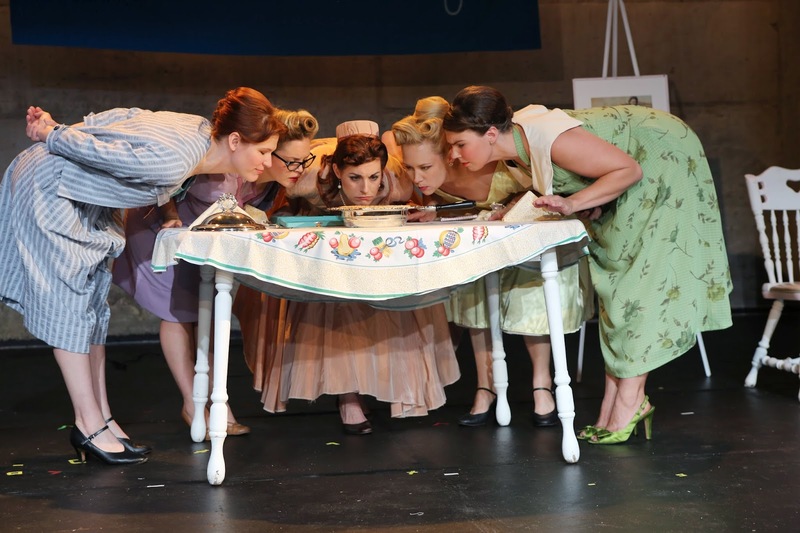 The hilarious send-up of 1950s cold war repression and kitsch culture, “5 Lesbians Eating Quiche” was an original critically-acclaimed creation by The New Colony. This remount featuring the original off-Broadway cast is presented by the Chicago Commercial Collective, running May 1 to June 8 at the Chopin Theatre, 1543 W. Division Street. Tickets ($15 - $40) are on sale now. The press performance will be Tuesday, May 6, at 7:30 p.m. The titular “5 Lesbians” are played by Caitlin Chuckta (Ginny), Rachel Farmer (Lulie), Kate Carson Groner (Dale), Megan Johns (Wren) and Thea Luxe (Vern). “5 Lesbians Eating a Quiche” will be performed at the Chopin Theatre, 1543 W. Division Street, Chicago. Previews run May 1 at 7:30 p.m, May 2 at 7:30 p.m., May 3 at 7:30 p.m. and May 4 at 2 p.m. Following the opening night performance on Tuesday, May 6, at 7:30 p.m., shows will run May 8 – June 8 on Thursdays, Fridays and Saturdays at 7:30 p.m. and Sundays at 2 p.m. Ticket prices range from $15 - $40, with 15 for $15 rush tickets available for each performance and 20% off for groups of 10 or more. They are on sale now at 5lesbianseatingaquiche.com or 773.404.7336 (open 12 noon to 8 p.m. on Wednesdays through Saturdays and 12 noon to 4 p.m. on Sundays). Andrew Hobgood is the founding artistic director of The New Colony where his work includes writing and directing the new musicals “Tupperware: An American Musical Fable,” “That Sordid Little Story,” and “Rise of The Numberless.” His directing credits include “Amelia Earhart: Jungle Princess;” the original and commercial productions of “FRAT;” “Hearts Full of Blood,” which won Outstanding Script at the 2010 New York International Fringe Festival, and “B-Side Studio,” a four-episode sitcom produced in collaboration with The Inconvenience and the University of Chicago TAPS program. His most recent play “reWILDing Genius” was commissioned by the University of Chicago and made its world premiere as part of the 2014 Steppenwolf Garage Rep Series. Evan Linder is a founding member and co-artistic director of The New Colony. A playwright and actor, Linder teaches playwriting at the University of Chicago and has had the pleasure of working with Victory Gardens, The Inconvenience, Collaboraction, Bailiwick Chicago, the side project and Bohemian Theater Ensemble since moving to Chicago. Other works include “FRAT,” “11:11,” “The Warriors,” “The Bear Suit of Happiness” and “B-Side Studio.” He was recently listed in Chicago Magazine’s 2013 Power List of Theater Scene-Stealers. The Chicago Commercial Collective is a commercial theater company focused on producing Chicago theater of incredible quality and commercial appeal, thereby helping Chicagoans discover the finest of their city’s vibrant theater scene and worthy Off-Loop productions find larger commercial success. Recent projects include the successful commercial remount last fall of TimeLine Theatre Company’s “To Master the Art” at Chicago’s Broadway Playhouse. The Collective is also presenting The Off-Loop Tour, which will export some of the best of Chicago theater throughout the Midwest in 2014-15. Productions on the tour include “there is a happiness that morning is” by Mickle Maher (originally produced by Theater Oobleck), “A Steady Rain” by Keith Huff (originally produced by Chicago Dramatists), “Unveiled” by Rohina Malik, “Honeybuns” by Dean Evans and “Crime Scene: A Chicago Anthology” by Anthony Moseley (both originally produced by Collaboraction). The Collective’s goal is to support a thriving small and mid-sized commercial theater scene. The Collective focuses on producing theater with proven popularity and builds upon the interest already generated during their original production runs. For investors, the Collective provides opportunities to partner on exciting projects with reasonable financial returns on their investments, while non-profit theater companies enjoy the benefits from their original successful productions that, due to scheduling issues or theater availability, may end before they have reached the audiences they deserve. Further, artists who question if Chicago’s theater job market can provide stability and fair wages can rely on the Collective to transform the local industry with the development of mid-sized commercial theater and consistent employment opportunities. The Chicago Commercial Collective is also presenting The Inconvenience’s “Hit the Wall” at the Greenhouse Theater, 2257 N. Lincoln Avenue, Chicago, April 22 to June 29. Tickets ($20 -$55) are on sale now at greenhousetheater.org, 773.404.7336 or the Greenhouse Theater Box Office (open 12 noon to 8 p.m. on Wednesdays through Saturdays and 12 noon to 4 p.m. on Sundays). Chicago Commercial Collective is located in the historic Fine Arts Building, 410 S. Michigan Ave, Suite 525, Chicago, IL 60605. For more information call (312) 724-7604 or visit chicagocommercialcollective.com. The New Colony, the 2011 recipient of the Broadway In Chicago Emerging Theater Award, strives to contribute original material to the American artistic canon and develop a new kind of theater going audience. Through collaboration with emerging artists of all disciplines, The New Colony continually develops new work and fresh perspectives. With the goal of exploring enticing subject matter and the common language of experience, The New Colony will cultivate the next generation of arts supporters. More information at thenewcolony.org.